We have never been able to resist the lure of keeping a very small herd of Anglo Nubians! Who could resist the wonderful colours, long ears and mournful cry. After all, saanen kids are very boring when they are born. They all come out white. Not so with the Anglo Nubian babies - you never know what colour you are going to get next. 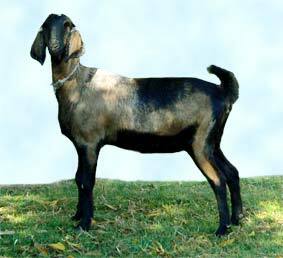 Anglo Nubians have lots of personality along with their good looks. They can make excellent pets. They hate the cold, so need warm comfortable shedding, particularly in colder climates. They are well suited to warmer, tropical climates. 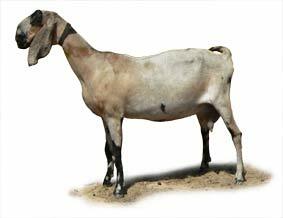 Anglo Nubians are in big demand at present, for export to overseas tropical countries. If you are interested in purchasing a kid, it may be best to place an order early. We will only be joining 2 purebred does this year, and between 10 and 15 second and third cross does. All the does will be joined this year to Kermore Montrose ("Monty"). Monty's head is the photo at the top of the page, and there is more about him further down. 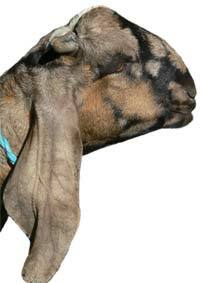 The two purebred Anglo Nubian does we will be joining this year are Janipha and Hyacinth who were bred by the Trilling Stud. 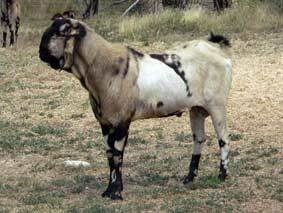 They are Killara Ram and Aremooc Bloodlines. Our daughters by an Aremooc Sparticus son are milking very well and have beautiful udders. This will be Hyacinth and Janipha 's first kidding for us, so we are looking forward to seeing what their milk production and udders will be like. 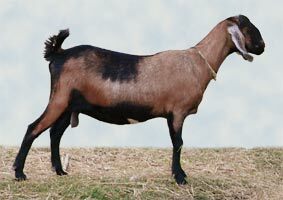 Our Anglo Nubian Sire for this season is the pure AN Anglo Nubian buck kid Kermore Montrose ANM540824. His Sire is Kermore Bob and his Dam is Kermore Manjula. Monty is already developing the good head of both his parents. He is a silver mottle. There are photos of his mum and dad below.